Now that it’s practically winter I find myself gravitating towards these three products the most. 1. benefit that gal primer: No face of makeup lasts or looks great without a good primer. I’ve been using this one for about three years and I love it. I put my makeup on for work around 6 am and at 6 pm I’m still good to go for an evening out. 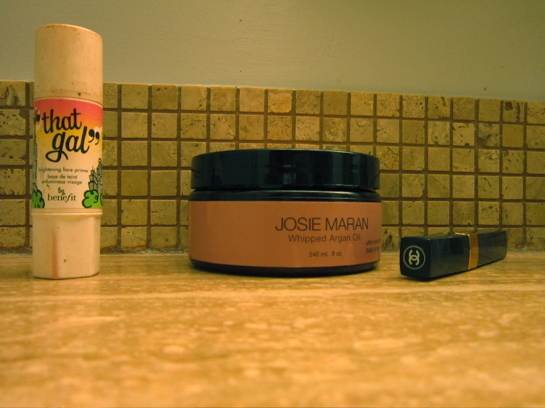 2. josie maran whipped argan oil body cream: First of all, it’s Maran like Karen, not Ma-ran. I’ve worked with Joise many times and not only is she fabulous but her products top notch. This body cream is my favorite, it keeps everything perfectly moisturized even during the driest months. 3. chanel mascara: I’ve been wearing mascara for something like 16 years, which is enough to consider myself an “expert.” Not only does this one lengthen and separate but it volumizes as well which is a basically unheard of trifecta in the mascara world. It’s a bit pricey but worth it, trust me. I’ll have to try that Benefit primer! love me some chanel mascara! great beauty picks! I love all Josie Maran products–you should try out her hot oil hair capsules. They’ll change your life! I’m going to have to try out that body cream! It sounds amazing! I need to try that primer! I’ve been looking for a new one. I’ve been looking for a good primer. Thanks for sharing your knowledge with us! I’ve been wanting to try some of Josie Maran’s products, I’ve heard good things! And I love splurging on Chanel makeup, although I’m more of a lipstick gal. I really need to try that Chanel mascara! I really love that primer as well! I agree, makeup in the winter especially needs a good primer! going to have to try these, thank you! I just started using the Josie Maran argon oil on my face- my aesthetician suggested that I start adding a few drops to my foundation since I have dry skin. It works wonders, I’m definitely planning to try more of her products soon.